Biology is binary. Yes or no. In-between does not exist. We are here or we’re not; alive or dead; breathing or suffocating. I am reminded of a post I put up a year or so ago (and too lazy to go find), whereby I said that every decision can be made by answering the question: Do I stay or do I go? Do I stay in this job, or do I quit? Do I remain with this person or do I leave? Should I complete this book, or shelve it? Do I keep writing the blog, or do I walk away? I see the world, now more so than ever, as binary. Why would this be? Is it a function of getting older–I am alive now, but someday I will not be–or is it the increasing evidence of science? (Free will as a function of biology, yes or no.) 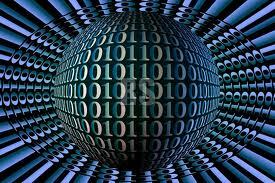 I exist, rapt in data stream of zeros and ones. Ten questions as prompt to starting a new life. What did you love as a kid? How many “things” do you really need? You’ve got ten minutes to pack a bag for surprise extended trip. What do you take? Why? Are you a beach, mountain, desert, woods or city person? Name three famous people you admired growing up. Your house is on fire. What do you pick up as you rush out? Rate your sense of adventure on a scale of one to ten, one being beach with chair, ten being Everest. Name three famous people you admire now. I’m not sure where any of this came from. I can only attribute it to the pressure of a deadline. When you wake up wondering what you will write about for the next day, your hours are spent in a scramble of desperation. Not that you are right or wrong…but as I age, I see life less as binary and more on a continuum, including the free will debate. As for green hair, I think I will keep it binary. There’s been a rush of recent work on free will by cognitive science, not that I pretend to understand it. The hopeful romantic in me longs for continuum put the hard-nosed part of me argues that even that–like an elegant computer program–can be sliced and diced down to zeros and ones. But then, who wants to ignore the pleasures of romanticism?